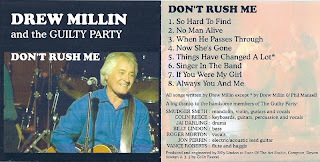 A song that I co-wrote in 1972 has just re-surfaced on a new CD by an old friend of mine, Drew Millin. The song. 'Things Have Changed A Lot', was one of a bunch of tunes we wrote when sharing a bungalow in sunny Torquay. I was a film student on holiday for the summer and Drew was selling advertising space on the local paper The Herald Express. But secretly, we both wanted to be rock stars - although as our band, The BOI, was a weird fusion of Crosby Stills and Nash and Frank Zappa, this was unlikely. We were either years ahead of our time - or rubbish. 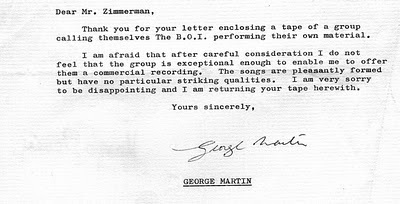 As the band's producer (alias Yorick Zimmerman) I sent demo tapes off to every record label, including the Beatles' Apple and John Peel's Dandelion Records, and each of them in turn rejected us. 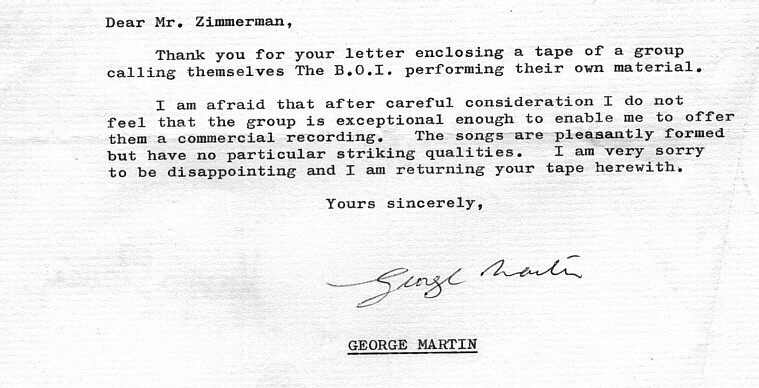 Above is the letter sent by legendary producer George Martin politely saying no. We were not, as we thought, the next Beatles. Now one of the "pleasantly formed" songs, as George Martin described them, is on Drew's CD 'Don't Rush Me'. Read all about it here - and buy a copy!